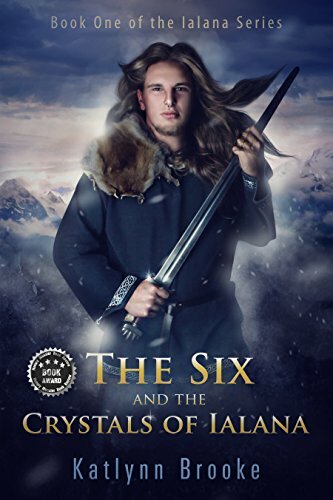 The Six and the Crystals if Ialana is a coming-of-age fantasy story rich with details, a large cast of characters, and a world rife with magic. What was the inspiration for the world of Ialana and the rich history you’ve built into it? My inspiration for Ialana arose from the myths and legends of the lost continent of Atlantis. In my Ialana Series, the City of Rhiannon is loosely based upon these legends, while the continent itself is drawn entirely from my imagination. In the first book, I also drew the mysterious island of Mu’A partially out of these so-called myths, but the bulk of the inspiration for that island actually came from a dream I once had. In this dream, I was an inhabitant of this island, and all the shielding technology—so-called “magic”— once existed. This dream was very real, so that is what I used as my basis for the shielding technology in my series. The history of Ialana is loosely based upon our own world’s lost history. I firmly believe that we are not the first civilization to inhabit this planet, and we won’t be the last. It is my opinion, and one that is shared by many, that technology is not new here, and that our current level of knowledge still has a ways to go. My series highlights the vast gap that now exists between science and spirituality, or what we think of as magic. I want to show how they can come together, to not be disparate from each other. In this story six kids realize they have more in common than they might suspect. What character did you enjoy writing for and why? I identified with Jarah, my main protagonist, the most. He feels different from not only the people of his village, but also from his family and his peers. While this may be a common teenage issue, his angst goes beyond the normal insecurities. When his dreams begin, his worst fears are confirmed: he is different to those around him. Each one of the six characters feel this gap between them and the people around them, but they each deal with it in different ways. They all know that their dreams are out of the ordinary, and that this sets them apart from their peers in a way that they must grapple with and try to understand. The kids are rescued by a mysterious shape-shifter named Irusan. This enigmatic creature becomes their first teacher. Why did you feel he was the best character to teach the kids about their past? Irusan is the “Gandalph” of the series. He is the archetype of the wise old man, the Mentor. Someone must help these kids to understand what is happening to them, and why, and Irusan is just strange enough that the kids will know without a shred of doubt that there is much more to reality than they’ve been taught. When they see with their own eyes what he is capable of, they must believe, and that helps them open up to the magic that is around them; and initially, with the help of crystals, the magic that they can tap into. I also hope that the reader will understand that we are only limited by our beliefs, and that if we knew what we were really capable of, we’d be amazed. This book is the first in a series. Can you tell us more about what we can expect as the story continues into books two and three? The Six and the Crystals of Ialana is the foundational book of the series. It sets the stage for all that is to follow, and I recommend that readers read them in the order they were written. It will help them to better understand the characters and the events that follow. In the second book, The Six and the Gardeners of Ialana, the Six continue on their healing mission, but they are thwarted by another despotic man, and hunted by a new enemy: yet another shape-shifter, but one that is the polar opposite to their mentor, Irusan. This one is capable of great magic and she and Irusan have a history that is hinted at in the rest of the series. The Six find themselves on the run again, and they must now find another hidden kingdom where they will be taught elemental command. They encounter many more challenges, as does their friend Blaidd, whose life has now taken an unexpected and tragic turn. In the third of the series, The Six and Anwyn of Ialana, the focus is still on the Six friends, but now there is an addition: a daughter. This girl, Anwyn, was born and raised in the elemental kingdom, and her skills surpass those of her parents and the Six. As they and Anwyn are now adepts in their chosen roles of healers, the opposition to them from the forces of evil increase. They find themselves facing enemies whose skills and abilities are equal to or even greater than theirs, and they must not only protect themselves, but at the same time save the planet from destruction. Mutant creatures, a Reptilian Dragon King, and a mysterious shape shifter… For fans of epic fantasy, the first book in the Ialana Series delivers a thrilling and fast-paced adventure saga. The quest, 500 years in the making to find and restore the lost crystals of Ialana, unites six young people who, along with a seventh between the ages of 15-21, were all born with a secret buried deep within. Guided by a shared dream, they leave the only homes they have ever known and set out on a life-altering quest through a maze of mountain caves and tunnels where they encounter insidious creatures, but none so dangerous, perhaps, as one of their very own. Mentored by Irusan the transcendental shape-shifter, the six young heroes develop impenetrable relationships and ultimately learn to rely upon one another. They battle their way to the lost crystal, but will they find it in time? Or, will their enemy succeed in his mission to control the powerful crystals of Ialana?